As we increasingly adopt sustainable lifestyles, repurposing everything from churches to cardboard scraps, there is one area we often overlook – reusing what we already possess. I’m specifically talking about upcycling legacy materials and furnishings in our homes to give them a second life. Sometimes we repurpose for sentimental reasons. It doesn’t matter if it is a hand-me-down that has seen better days and is in danger of falling apart. We balk at sending it to the landfill as it may be the sole physical connection to our past. At other times, it’s simply because we’re attached to a particular table or couch and want it updated to work with our new décor. As an interior designer, I love the challenge of creating custom furnishings that make use of my clients’ cherished possessions. Here are examples of products and materials that can be gracefully recycled into interior furnishings. Chair and ottoman upholstered in a collage of pre-loved fabrics. 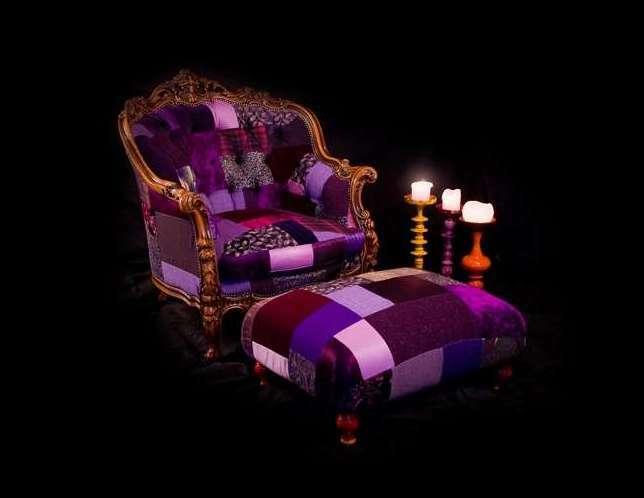 So long as the material at hand is suitable for upholstery applications, we can upcycle fabrics and apply them to seating pieces in a creative manner. 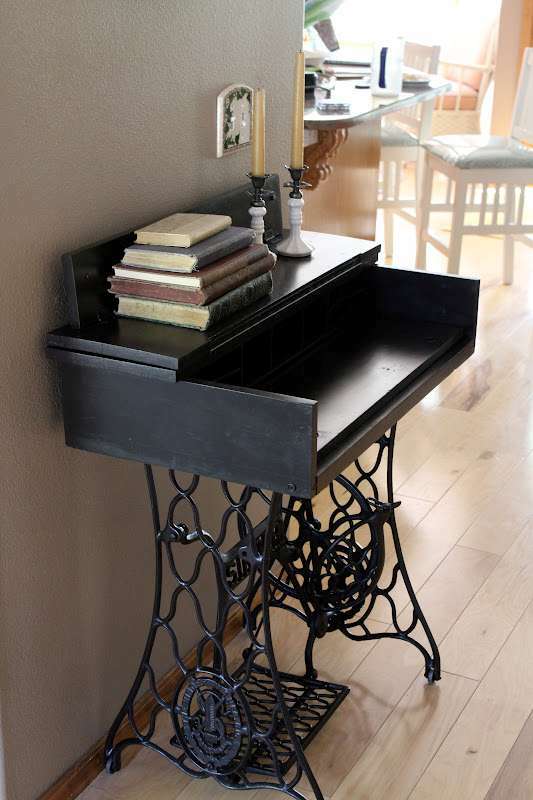 Creative reuse of salvaged Singer sewing machine base. It’s always pained me to see old sewing machine bases being discarded. For those lucky enough to possess one, this is a beautiful way to recycle an iconic appliance from an age gone by. 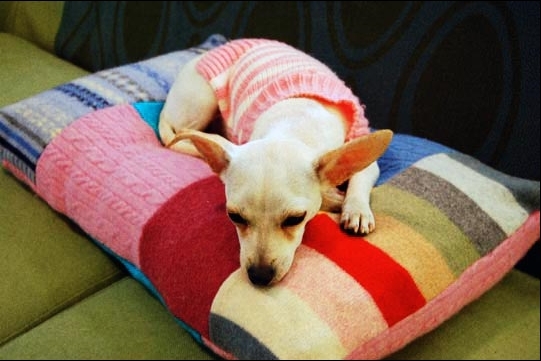 Since pets are often an important part of the household, here is a great way to use old sweaters. These woolens are upcycled into a lovely patchwork pillow and literally have gone to the dog(s). 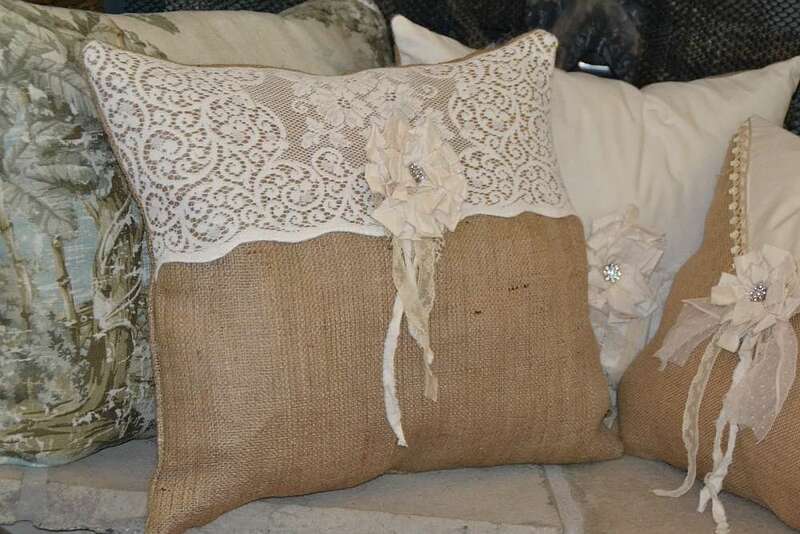 Burlap and vintage lace make a fetching combination for pillows. Pillows from old tablecloths and antique lace can pass on a tangible piece of the family history. 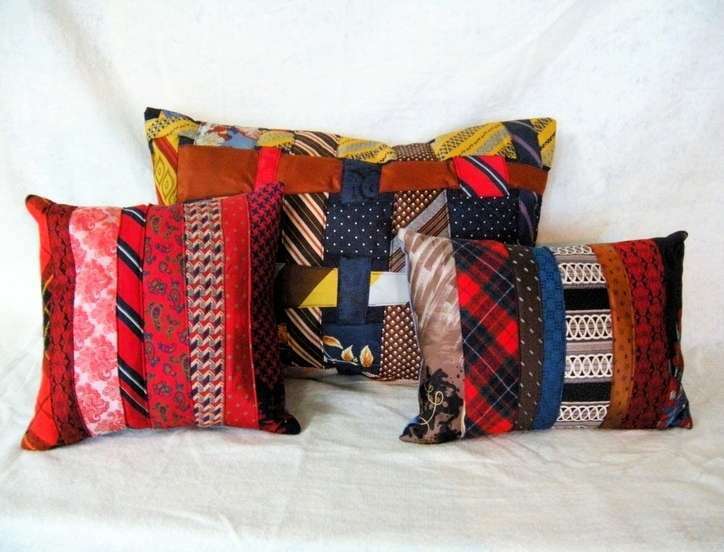 Colorful ties reincarnate into accent pillows. There was a time when ties were de riguer in every gentleman’s wardrobe. As fashion changed and generations pass, these custom pillows make meaningful keepsakes. 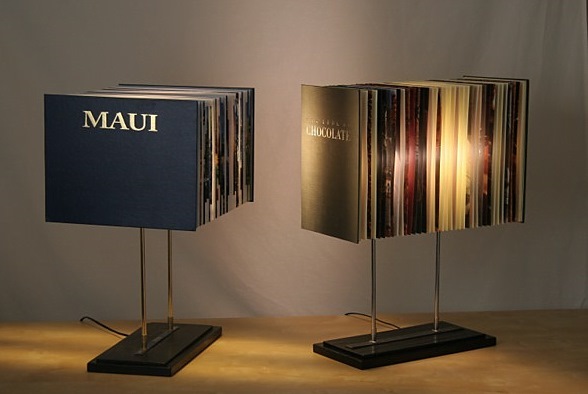 Coffee table and art books ingenuously turn into bespoke lighting fixtures. For those who love the printed word, what’s better than using the actual cover and pages of a hard cover book to transform them into real beacons for learning? 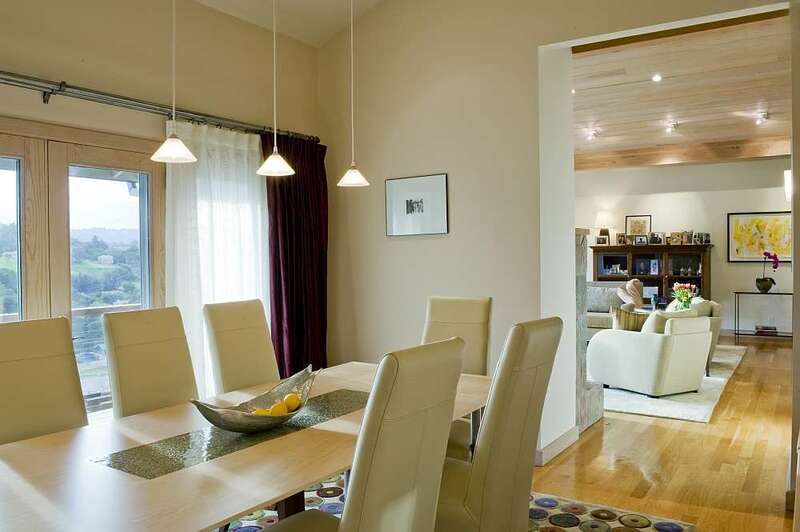 These unique creations are available as table or ceiling lamps. 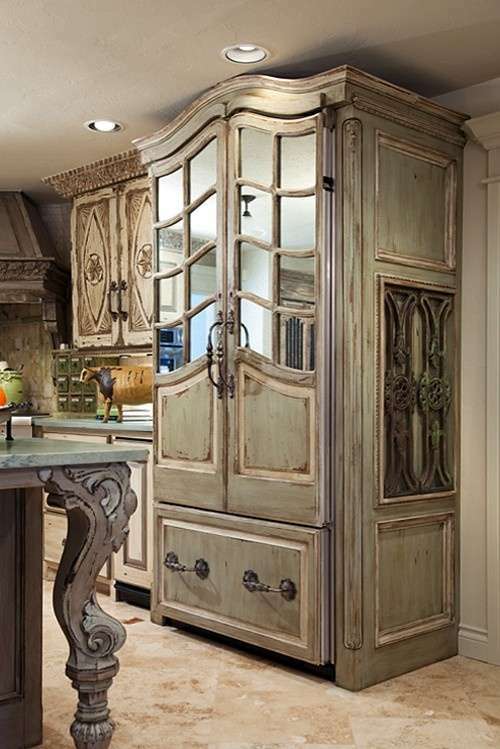 Creative reuse of an armoire by turning it into a refrigerator cabinet! There are many ways to repurpose an old armoire, but this is one of the more interesting (and challenging) ways. Window coverings and reclaimed fabrics make a perfect match. 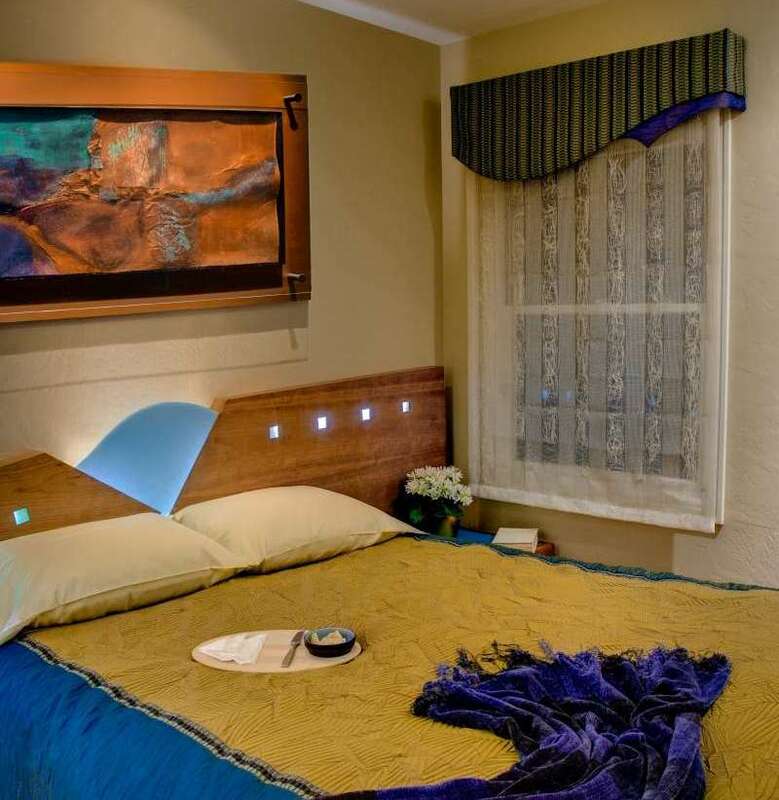 Something old, something new – I love to integrate different fabrics in custom window treatments. Valences or cornices work wonderfully since it’s relatively easy to tailor the design to work with the client’s available material. For the biking enthusiast, this is a decorative accessory that is as appropriate as it is eco-friendly. 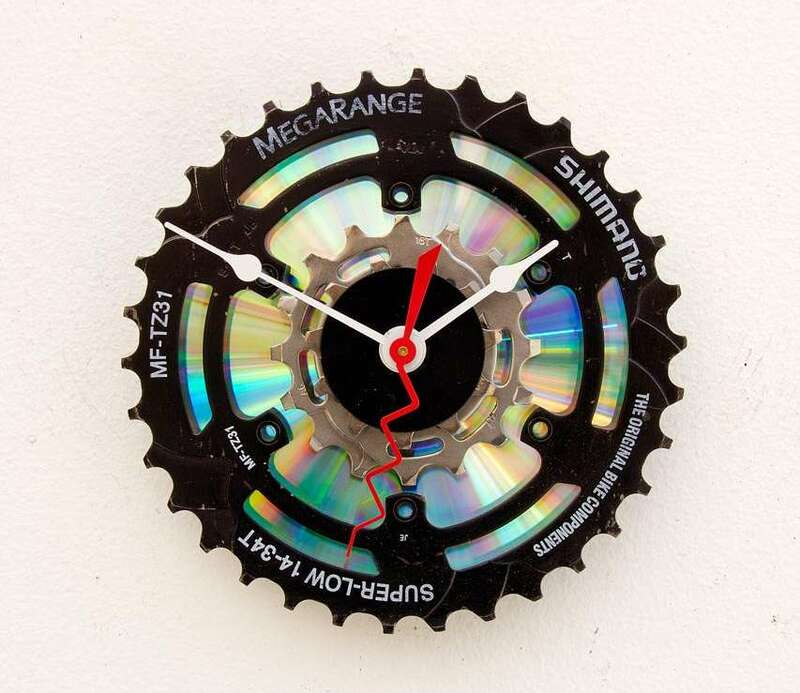 This wall clock is made of bicycle cassette gear and a computer CD. Considering tons of these products lie fallow in the local dumps, recycling personal bicycle parts kills multiple birds with a single stone. Dining table with custom art glass inset. When a client wanted to update up an existing dining room table to better complement her new décor, I added a panel of recycled art glass to bring out the colors of her area rug. 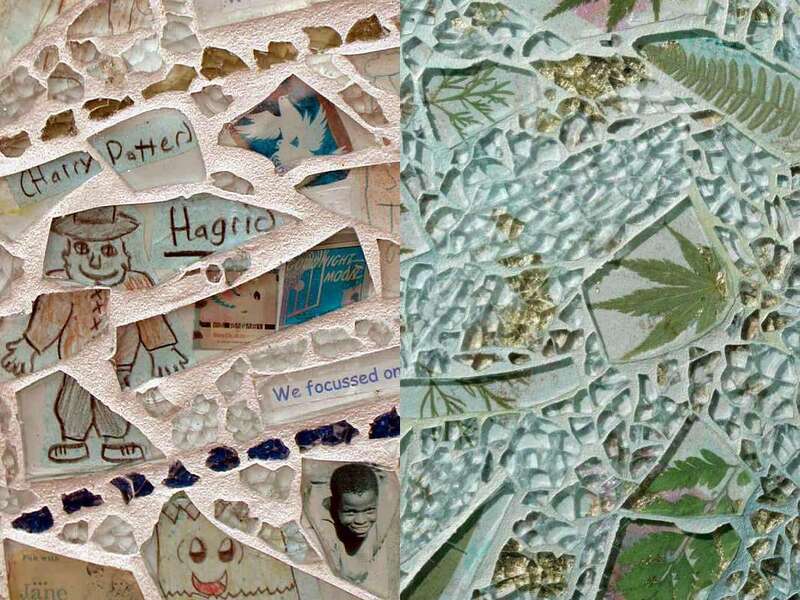 Perfect for a young Harry Potter fan or an avid gardener, here are 2 examples of custom media embedded in the art glass. 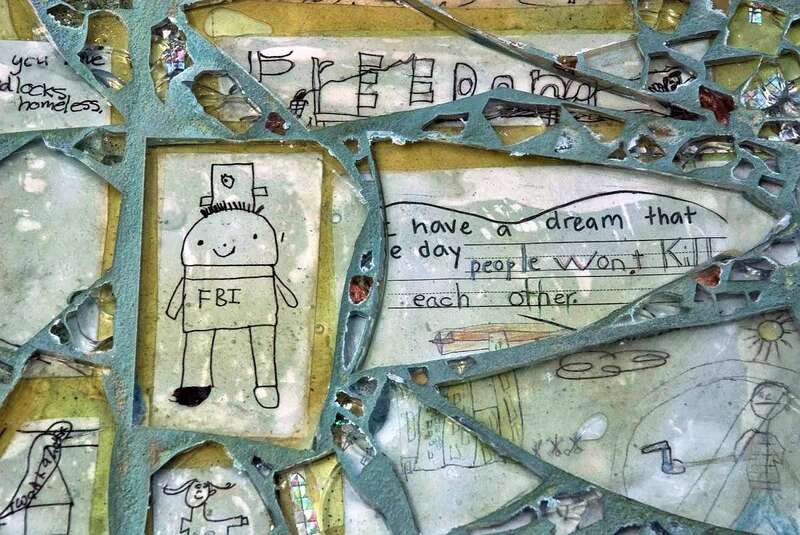 There are numerous ways to personalize this artful glasswork – photographs, text, foliage, textiles, wallpapers and paint colors can be provided or specified for inclusion into the product. This entry was posted in Fabrics, Furniture, Green Design & Construction, Interior Design, Lighting and tagged Ceiling Light Fixture, Eco-friendly, Green Design, Green Lighting, Interior Design, Lighting Fixture, Pillows, Recycled material, Repurpose, Sustainable Design, Upcycle, Upholstery Fabrics by Marie Chan. Bookmark the permalink. This is a more meaningful and mindful alternative to treat our possessions, be they prized or just surplus, in this disposable society.